Just picture it. 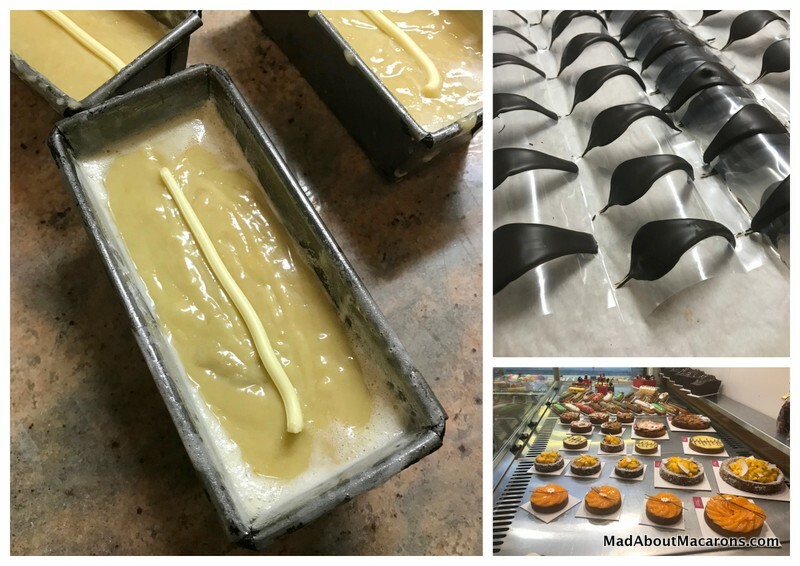 A French bakery run by a couple passionate about patisserie called Baisers Sucrés – literally translated as Sweet Kisses Patisserie Paris. 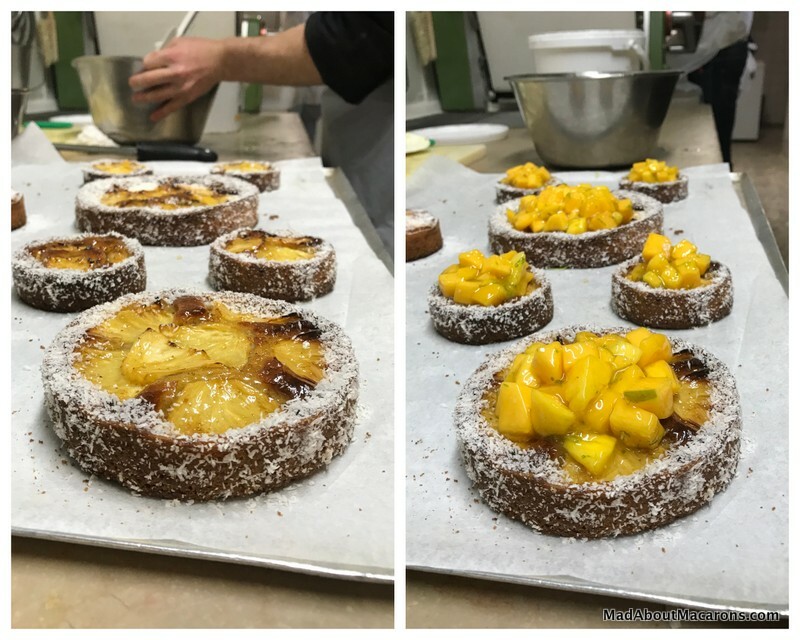 After Kévin and Gnagalé Béziers’ Galettes des Rois tasting last month, I was fascinated to find out what the creative couple were dreaming up for Saint Valentine’s Day. So imagine my excitement when I was invited to share in their unique Valentine’s creation at their recently opened boutique in the heart of Paris’s 10th Arrondissement for an exclusive article here on le blog. 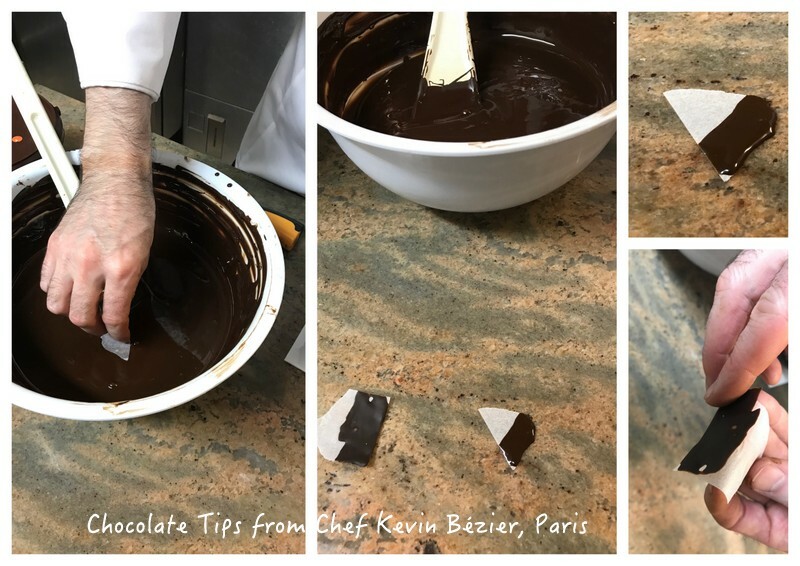 Kevin Bézier is no stranger to teaching patisserie and with a serious line-up of 20-years’ experience at the hotel Lutétia, Georges V and Ritz-Escoffier school, on meeting his wife, Gnagalé the couple created Baisers Sucrés in 2013. 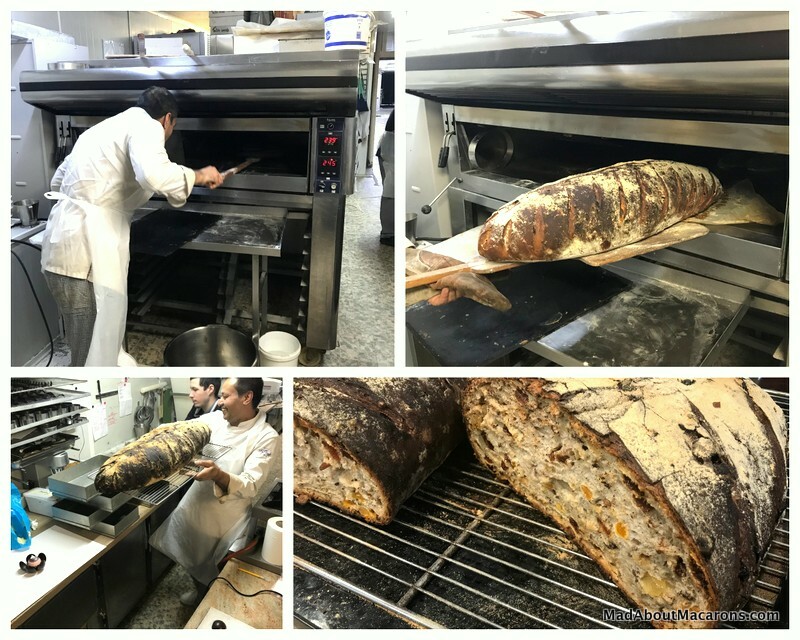 As of April 2017, their boutique is more of a showroom for their patisserie consultancy/catering business already based in Bagnolet, east of Paris. Their showroom boutique is not far from Gare du Nord and Gare de l’Est and around the corner from the 10th’s Town Hall or Mairie: perhaps not the most romantic side of Paris, and when I visited last week during the floods in Paris, the nearest Metro stop at Château d’Eau seemed particularly appropriate. Needless to say, taking photos for you wasn’t in the best of conditions with such a lack of sunlight but the colourful display of cakes and pastries made up for it. 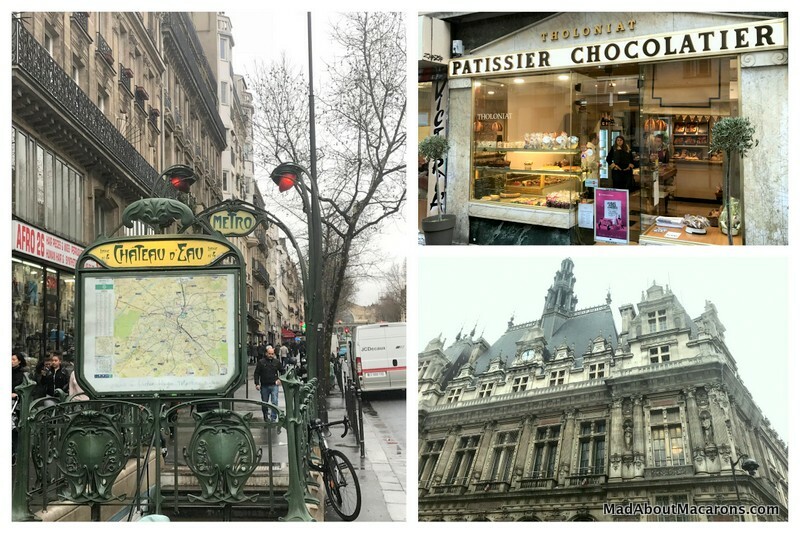 An astonishing showcase boutique it is: from macarons in the window, to all sorts of shining éclairs, cakes (from traditional French “cakes” to patisserie items) and seasonal fruit tarts from lemon to apple or pear tartes aux pommes ou poires. The velvet red cube, “L’entremet Révolution”, is another of their specialities with a chocolate and Earl Grey mousse with a slightly bitter raspberry ganache. It’s unusual for a patisserie to also sell bread, but I could see it was just as popular with the locals. 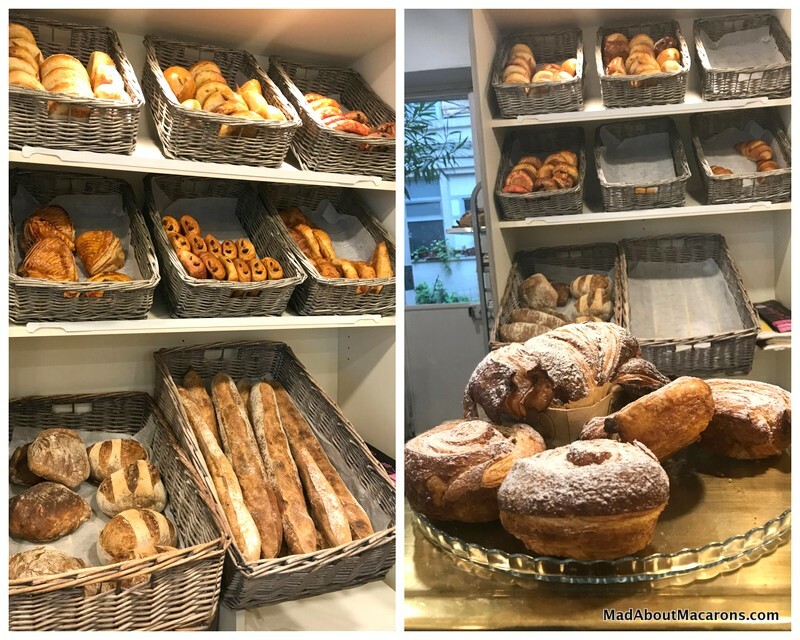 By the time we’d finished in their lab, most of the oversized brioches, rustic baguettes, and other Viennoiseries – the umbrella term for croissants, pains au chocolat, chaussons aux pommes, and the likes – had pretty much disappeared! 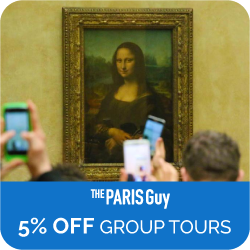 I hear they also make giant Kouign Amman pastries for 6 people. 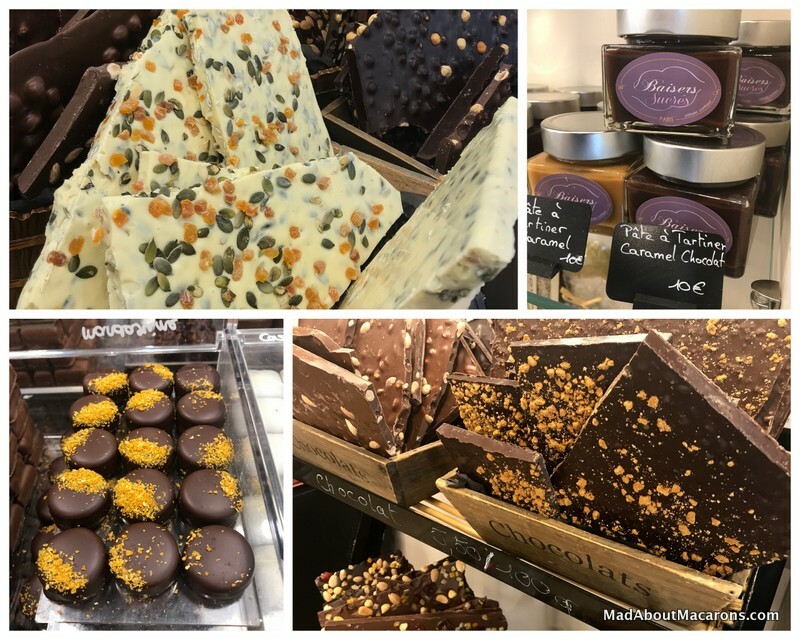 The real star of the show at Baisers Sucrés is the house speciality, carried on from the tradition of the previous boutique, Tholoniat, and it’s here that they’ve been breathing their own new life back into the boutique. Etienne Tholoniat originally opened the boutique in 1938 and went on to become a Meilleur Ouvrier de France in 1952, spreading her reputation as far as Japan and the Vatican, where Pope Paul VI ordered a sugar basket in Vatican colours. 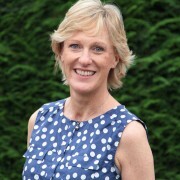 It was her Semifreddo, however, that stole the show and continued with her son, Christian. I watched the Baisers Sucrés dream team in the back lovingly prepare this frozen dessert, spreading a mixture of whipped cream and caramelised nougatine between génoise sponges, then finishing it off like a crème brûlée. Moreover, we can’t forget it’s also a chocolatier, chocolate shop. 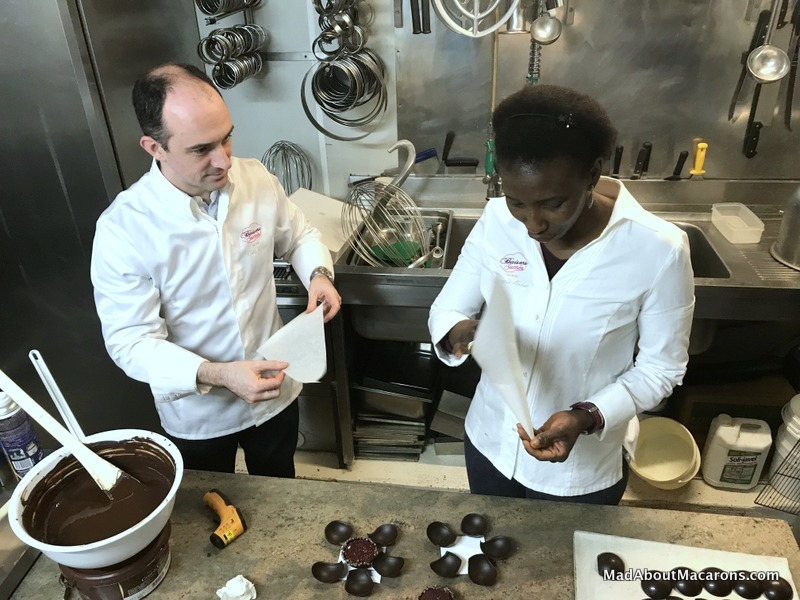 I cheekily asked Kevin and Gnagalé if they were tempted to follow the Nutella riotous promotions and reduce their Chocolate Caramel spread – but of course, chocolatiers don’t do that with such quality! 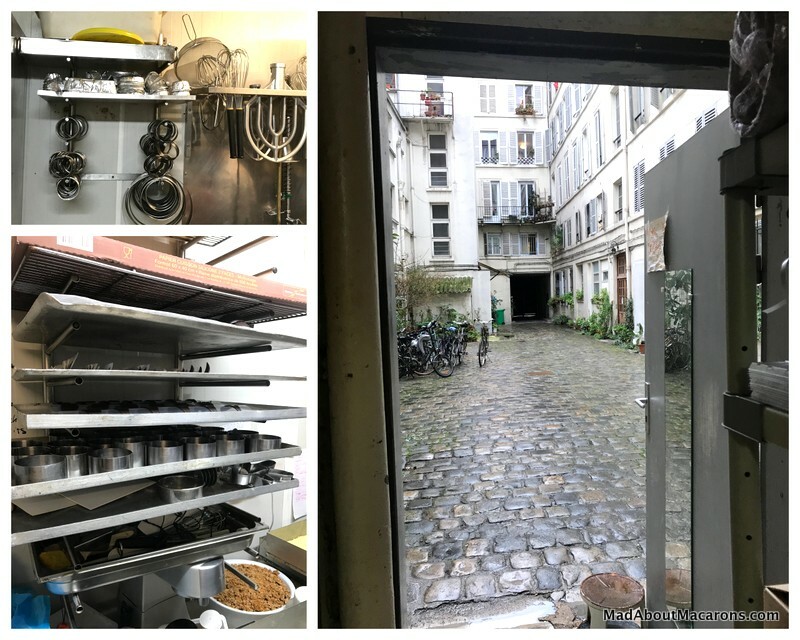 Which brings us to the Sweet Kisses Patisserie Paris Valentine’s creation they were about to show me backstage in their lab, situated at the end of the most charming Parisian courtyard. With severe lack of light and yet another downpour, let’s keep it romantic and steer our attention to the glistening cobbles and green plants before entering a tiny sweet haven in the midst of the 10th. First, the wafting smells of traditional, artisanal bread from their gigantic oven had me in raptures. I’d already had breakfast chez moi, but when the sizeable prize loaf was revealed then transported across the courtyard to the boutique, I was hoping I could grab a fruity-nutty slice en route. They make this pain aux fruits every Wednesday and Saturday. It was time to get cracking on with the first stages of the Valentine’s creation, The Hibiscus Flower, or Fleur d’hibiscus. There were no hearts in the creation; instead they were saying it with flowers – and their love for chocolate as a couple. Already the chocolate was being tempered to 31°C. 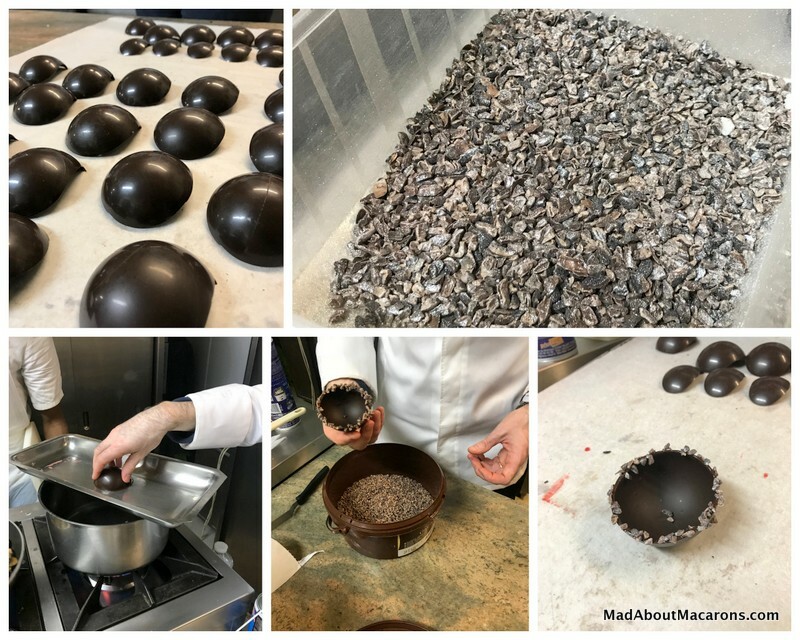 A loaded tray of dark chocolate half sphere shells were waiting in line, as a large pot of simmering water acted as a Bain Marie to melt the tops of each, then plunge them into cocoa nibs coated in silver edible glitter. It’s at this point that Chef Kevin shows me a tip. 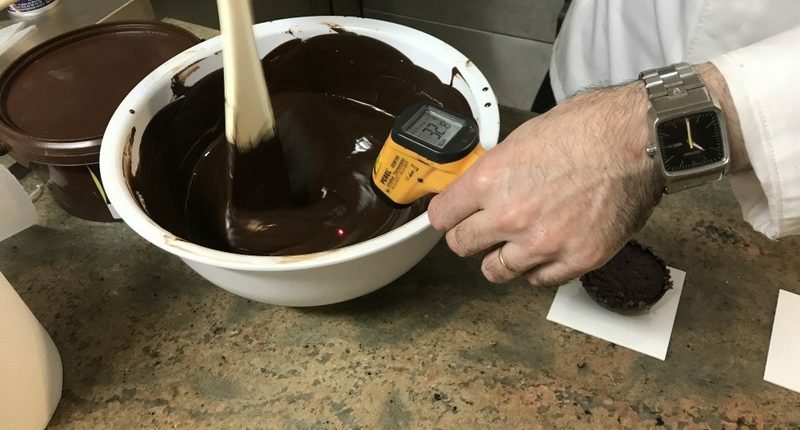 As he’s tempering the chocolate and using a thermometer, he finds the best test is to dip in a ripped off piece of baking parchment and leave it on the counter to see if it hardens correctly. It’s ready, as he peels a bit off the paper. As they both roll up baking paper into mini cornets to pipe out the chocolate, the ingredients now come into place. 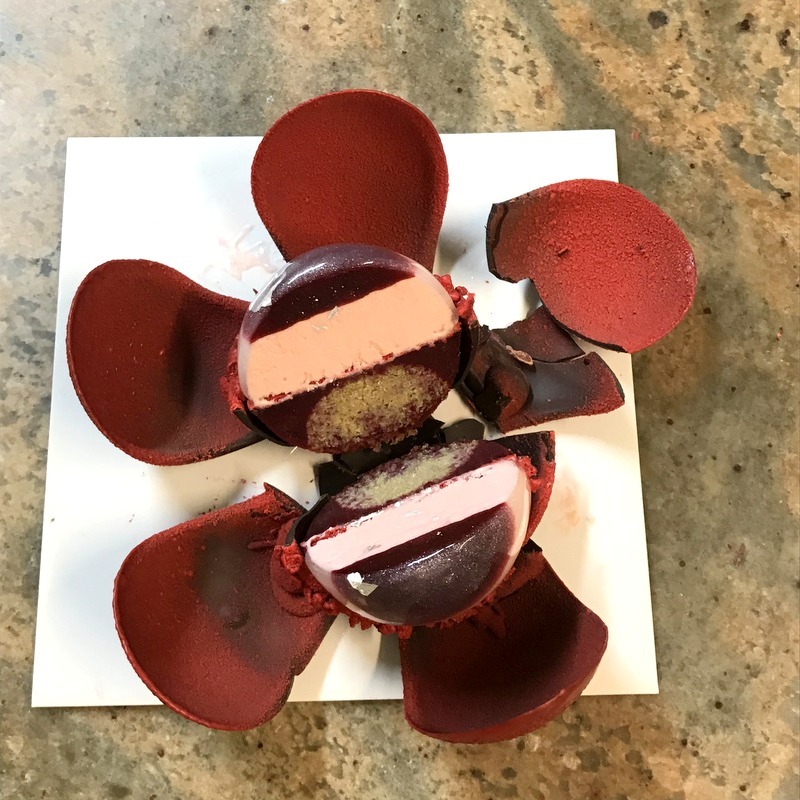 The tempered chocolate acts as a delicious glue, holding a half sphere of chocolate filled with a previously prepared dome of hibiscus jelly covering a lemon and Earl Grey sponge. 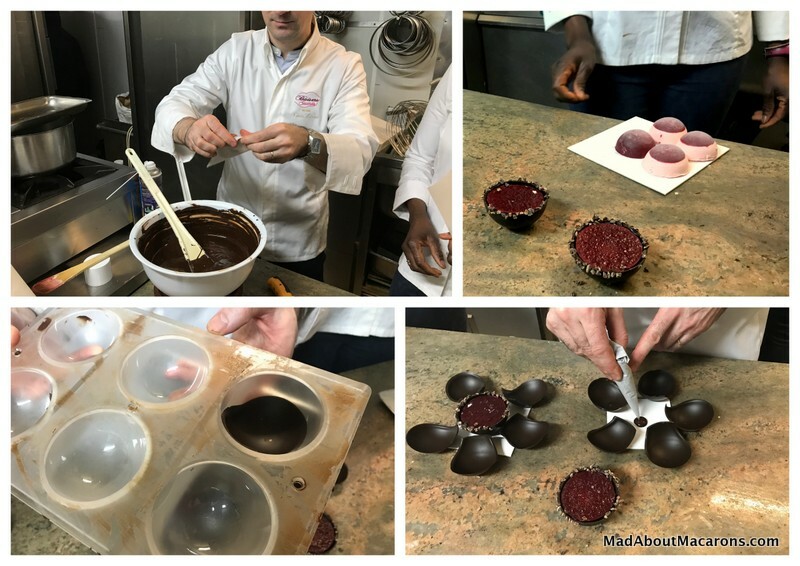 Next come the hibiscus chocolate petals, previously prepared using half-sphere chocolate moulds. 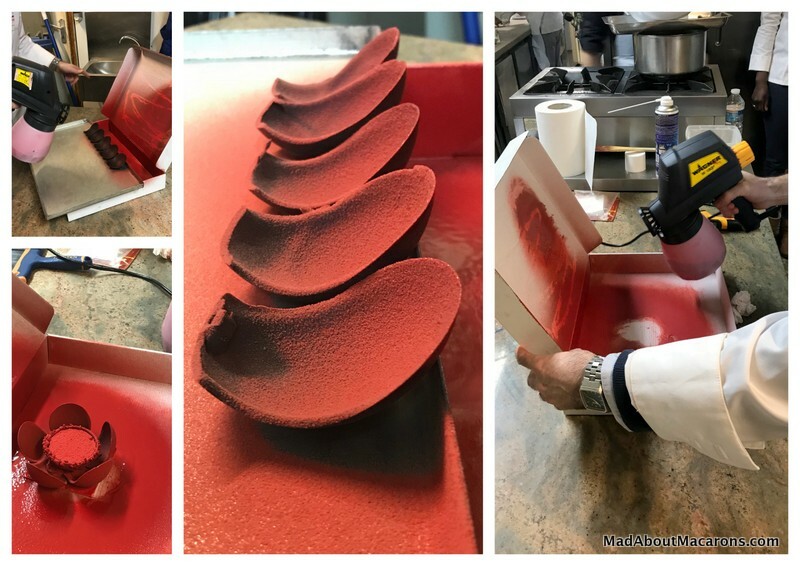 Each chilled chocolate petal is stationed in line before being sprayed with a coloured white chocolate velours. The effect is magic, with micro particles coating the chilled petals. 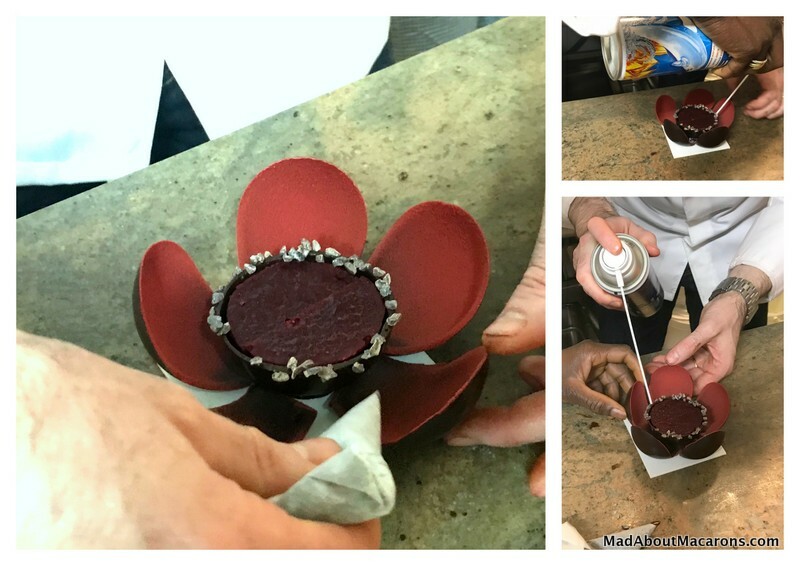 Kevin and Gnagalé prepared 3 different versions: a plain chocolate-petaled flower, a fully sprayed version and this version of just half sprayed on the petals, which the couple eventually decide to choose for the Valentine’s Hibiscus Flower. On goes the chocolate glue to stick on the petals, followed by quick freezing sprays to hold them in place. The flower’s dome topping of Pink Champagne mousse perfumed with hibiscus flowers is given a neutral glaze with added silver lustre for that special je ne sais quoi. Meanwhile, picture the scene as the team is swarming around our table in such a small space, carrying off their latest tarts and cakes to the shop. Totally distracted I was, watching this pineapple coconut tart being topped with mango and lime then finished off with coconut shavings – a taste of the exotic which I gather is from Gnagalé’s native Senegal. Another tip from the chef came as these lemon cakes were being prepared. He adds the final touch: a thin piping of butter in the middle to help crack open the cake in the middle. Isn’t that funny? In the UK, we’d be in horror with cracks in our cakes but in France, they encourage it! More petals for another dessert were sitting ready for their turn in the lab but back to the Hibiscus Chocolate Flower. Gnagalé carefully tops each dome with silver leaf and the Valentine’s chocolate is ready to go. Now for the cross-section and tasting! 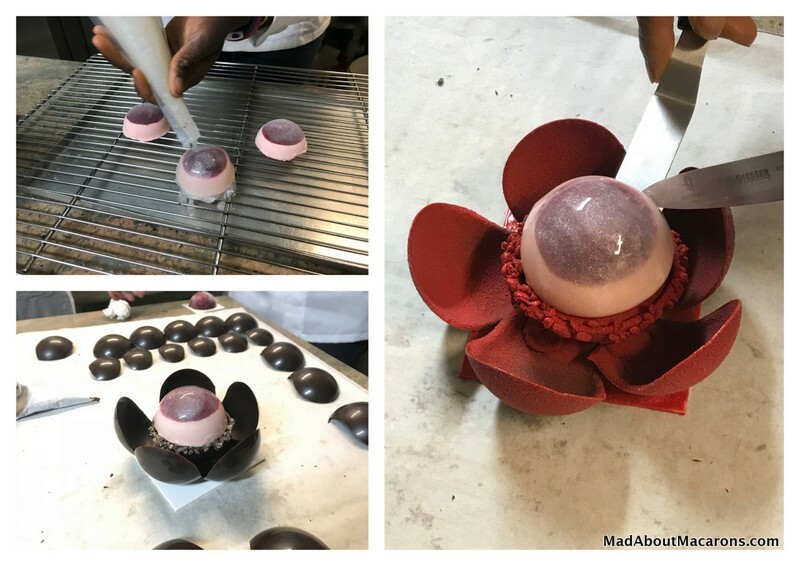 Here you have it in a Hibiscus Flower: a Mexican 66% dark chocolate dome filled with hibiscus jelly with lemon and Earl Grey tea sponge, topped by a silver-glazed dome of Pink Champagne and hibiscus flower mousse, all encased in red chocolate velour petals. The verdict: a tour de force of textures from the soft, crispy and fondant with light and subtle flavours to be enjoyed at room temperature (since this was still chilled. 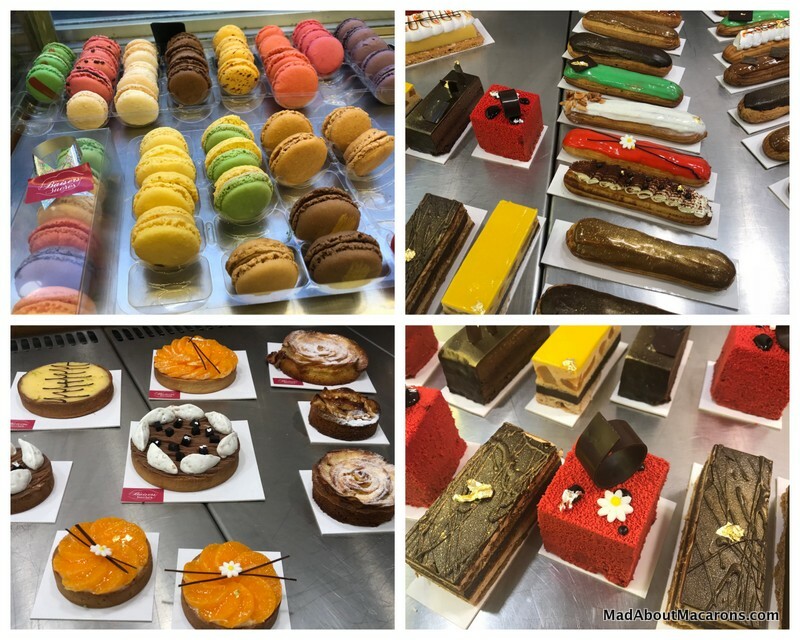 It also wasn’t that sweet – something I keep mentioning about why French patisserie is in another league: they don’t add too much sugar so that you can appreciate the flavours. All that was missing? A glass of pink Champagne and my Valentine! 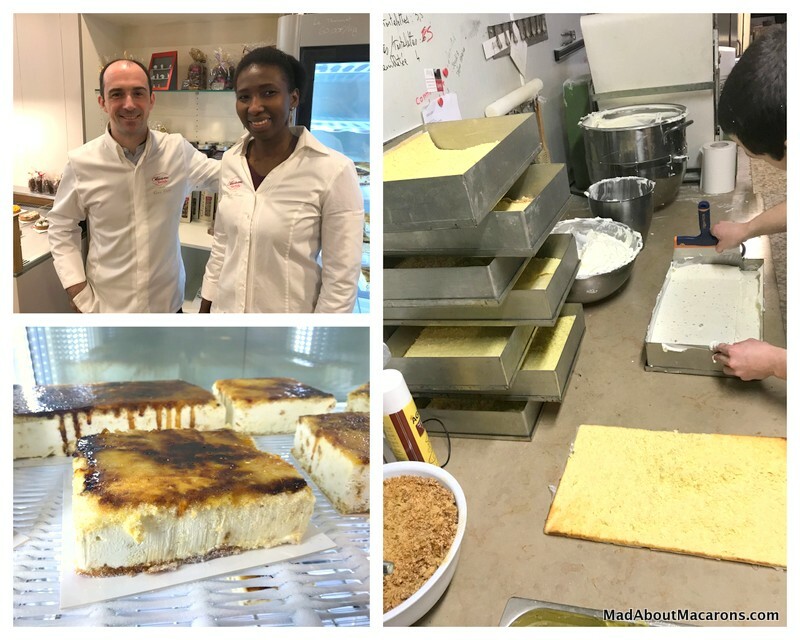 With huge thanks to Chefs Kevin and Gnagalé Bézier for inviting me into their lab and Tholoniat Boutique of Baisers Sucrés. Now it’s over to you to visit them and taste their specialities for yourselves. I discovered that they’re true to their credo: to share in the pleasure. 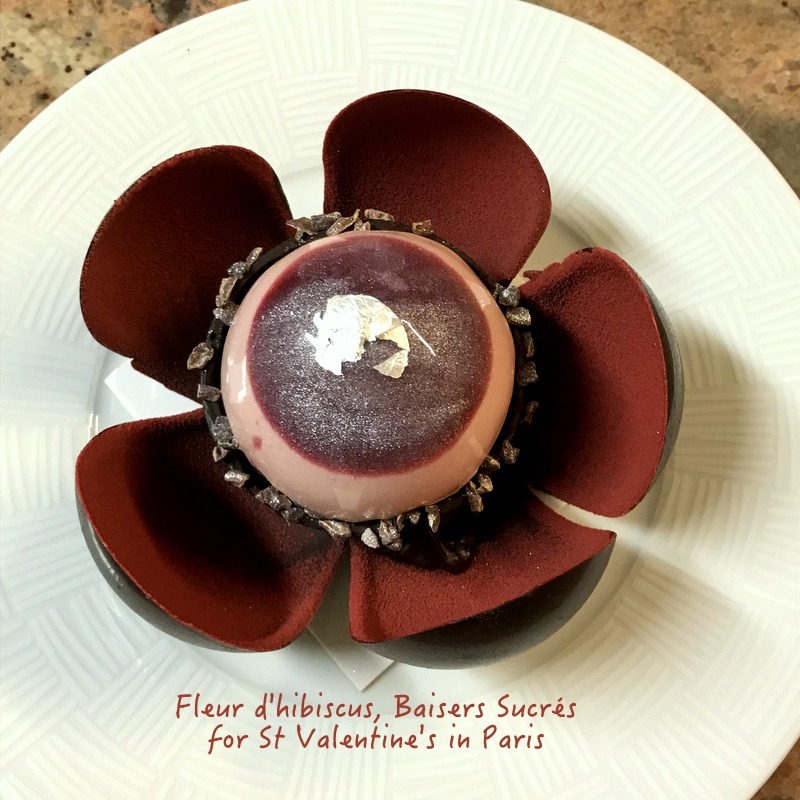 Wishing you a very Happy Valentine’s Day with the Fleur d’hibiscus from Baisers Sucrés, or let’s say from Sweet Kisses Patisserie Paris. Update! 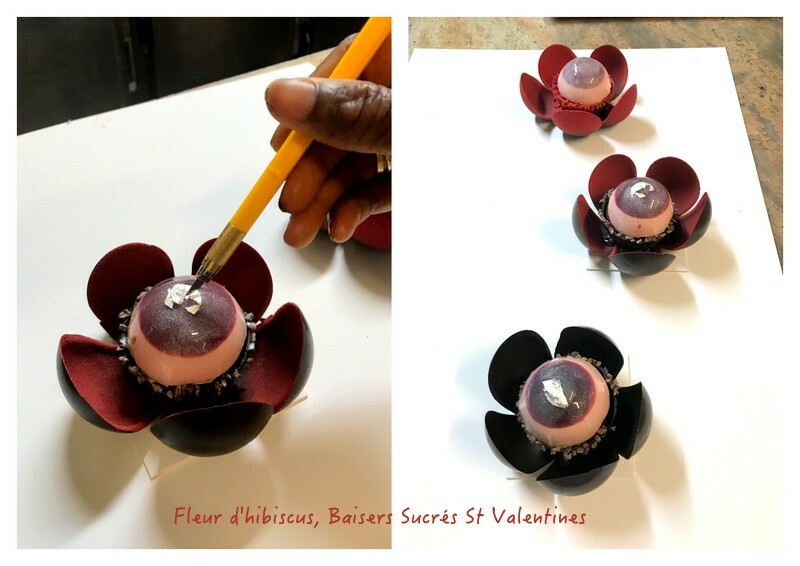 This has proved so popular with clients that Baisers Sucrés have decided to continue with the Fleur d’Hibiscus, even after Saint Valentine’s!